CheMin is a definitive mineralogy instrument that analyzes the minerals that are present in rocks and soil samples which are delivered to the instrument by the Sample Acquisition, Sample Processing and Handling (SA/SPaH) system. It can identify and quantify minerals accurately and in a time efficient manner. By determining mineral properties, CheMin will provide information on the involvement of water in the formation, deposition or alteration of rocks and soil sediments. Data from this instrument will also contribute to finding potential mineral biosignatures, energy sources for life or indications of past habitable environments that are recorded in sediments and rocks. CheMin is a powder X-Ray Diffraction (XRD) instrument with X-Ray Fluorescence (XRF) capabilities. It is a part of the analytical laboratory of the MSL Rover which is installed inside the main body of the vehicle. 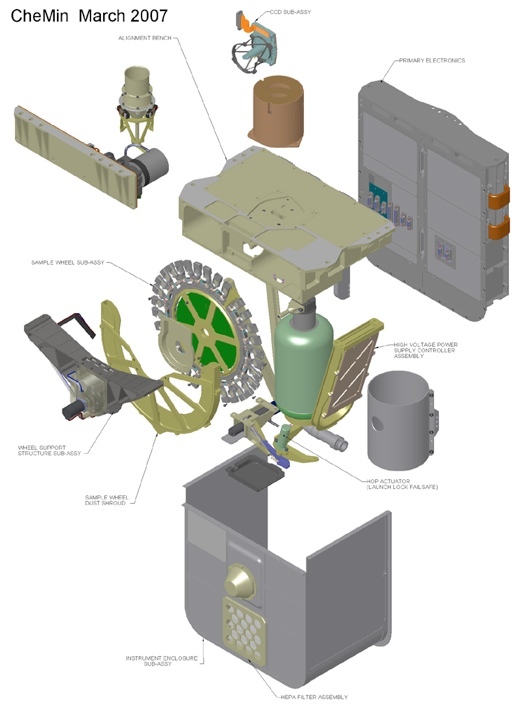 74 samples will be analyzed during the prime mission of the instrument, but there is a potential for additional analyses as the sample cells of the instrument can be re-used. 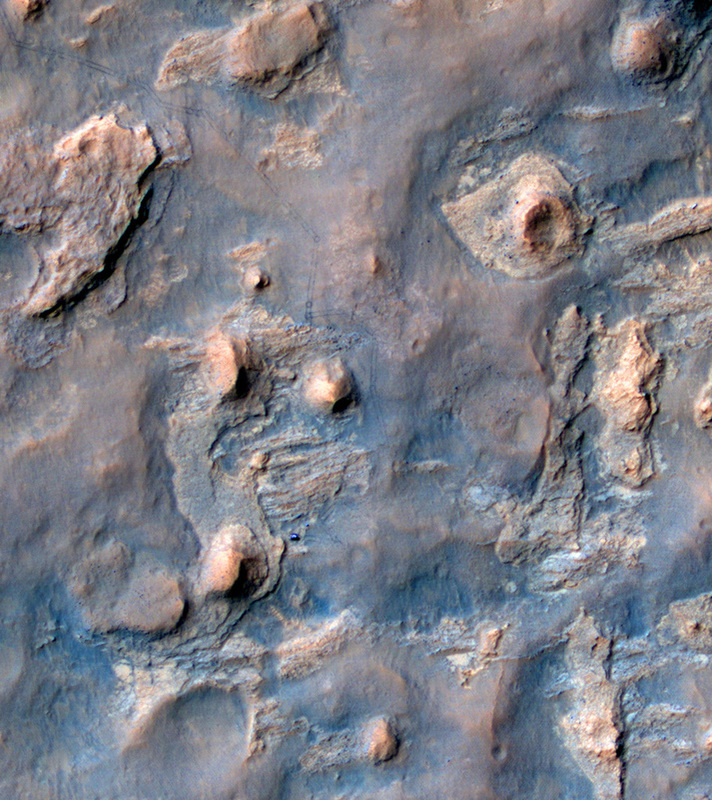 A single sample analysis takes up to 10 hours that is being spread out over several martian nights, but it is expected that acceptable results for most samples will be provided in a shorter timeframe. 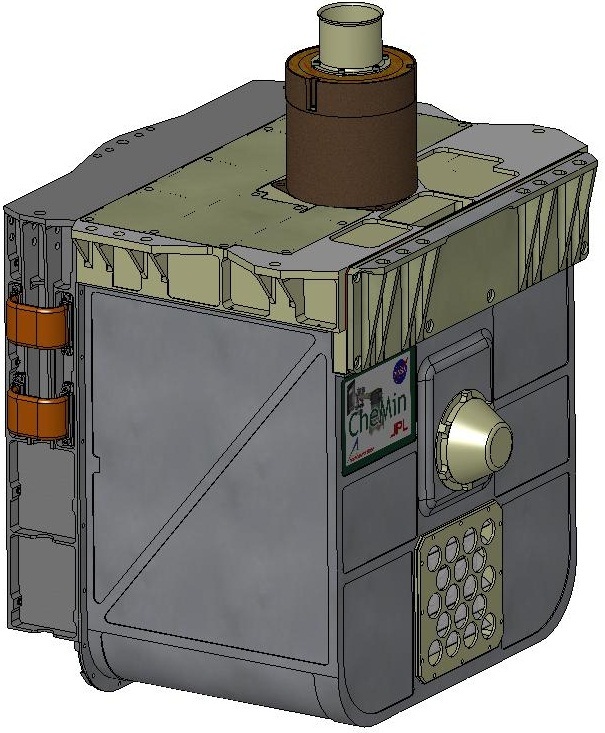 Major components of CheMin include a microfocus cobalt X-ray source, a transmission sample cell, and an energy-discriminating X-ray sensitive CCD. Simultaneous 2-D X-Ray diffraction patterns and histograms from powdered samples are provided by the instrument. 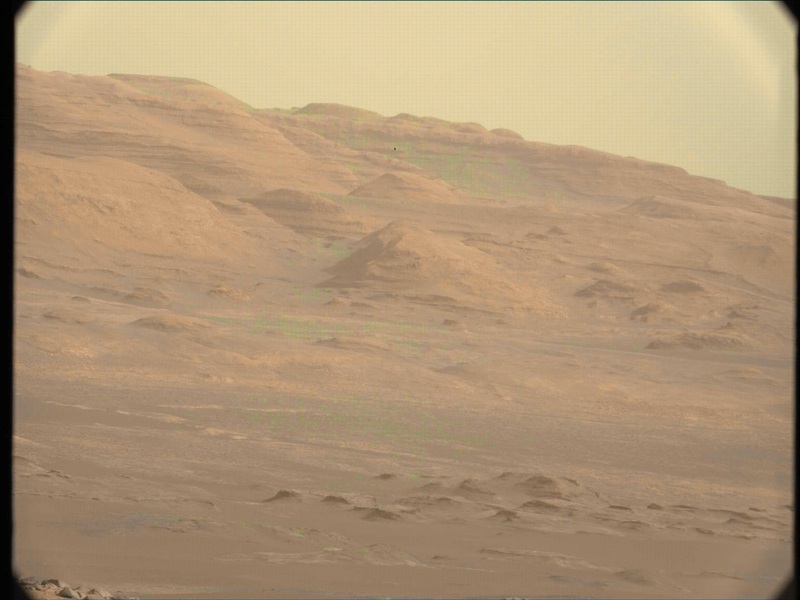 CCD Frames in Raw Data are processed aboard the rover to reduce the data volume that has to be downlinked to Earth. When received on Earth, CheMin Data undergoes extensive analyses. During the process of analyzing a sample, a collimated beam of X-Ray Radiation from the X-Ray Tube is directed through a sample cell that contains powdered material prepared and delivered by the SA/SPaH Subsystem. The collimated X-Ray beam is 50µm in diameter and illuminates the center of the 8mm diameter, 175µm thick sample cell that is bounded by 6µm Mylar or thicker Kapton windows. Mylar and Kapton-window cells are installed on the wheel that contains all 32 cells. Both types have different advantages. Mylar windows have a very flat diffraction background but the material is less durable under severe vibration and it is susceptible to destruction when exposed to acidic samples. Kapton windows can withstand acid exposure and vibration but contribute small diffractions which could interfere with diffraction peaks of some materials such as clay. 13 Kapton cells and 14 Mylar cells along with 4 Mylar and 1 Kapton standard compartments are installed on the wheel. 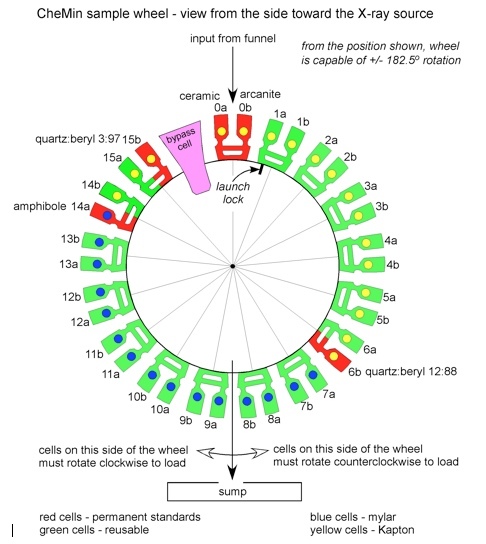 This sample wheel can be rotated to put the desired cell into the proper position for sample transfer and analyses. It is capable of a +/-182.5° rotation. On the opposite side of the cell, an X-Ray sensitive CCD detects X-Rays diffracted or fluoresced by the sample. 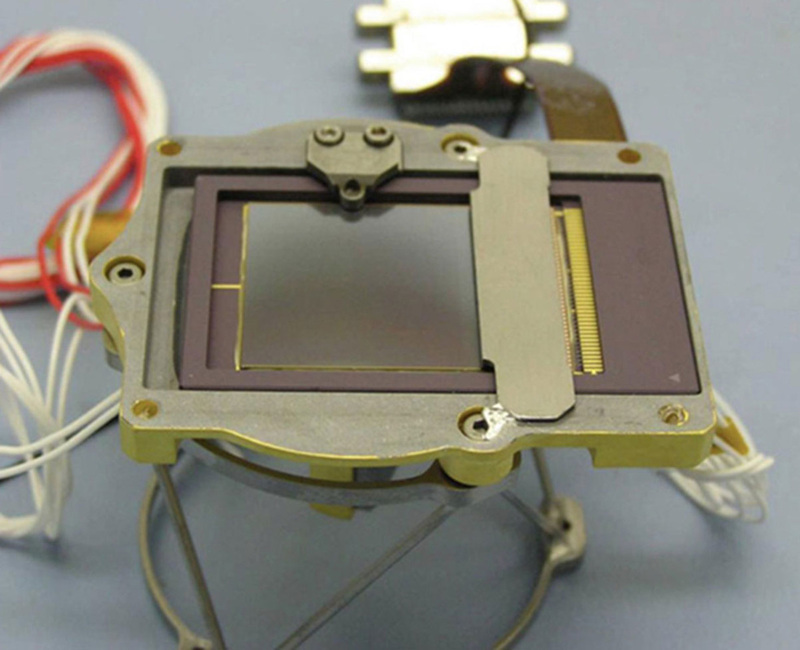 The CCD is a 600 × 600 E2V CCD-224 frame transfer imager operated with a 600 × 582 collection area. Each pixel on the CCD is 40 × 40 µm². This detector is operated in a single-photon counting mode. In the process of a single analysis, the detector is exposed to the X-Ray Beam, read out and erased more than 1000 times. Operated in this mode, the CCD measures the energy each photon contains. A 2-D diffraction pattern is generated by X-Rays that are diffracted and identified by their energy. All other X-Rays that are detected by the CCD are being processed into a histogram showing the number of photons vs. photon energy that constitutes an energy-dispersive histogram of the particular sample. Each sample results in an XRD 2-theta plot that sums up diffracted photons and a X-Ray Dispersive Histogram that sums up all X-Ray Photons detected by the CCD showing the elements the sample is comprised of and giving information on mineral constituents. The sample handling system is comprised of a funnel, a sample wheel carrying 27 re-usable sample cells and 5 permanent reference standards and a sample sump to dump material after analyses are complete. Powders or scoop samples are delivered to CheMin from the SA/SPaH (Sample Acquisition/Sample Processing and Handling) system through the drill, scoop and CHIMRA assorting assembly. CHIMRA is pre-screening the sample material to ensure that the CheMin funnel screen is not clogged. Samples are being pre-screened to 1mm and to 150µm grain diameter. A maximum of 65mm³ of sample material is delivered via a vibrated funnel system that penetrates the rover deck. Only 10mm³ are required to fill the sample cell adequately – the rest remains inside a reservoir above the cell which is dumped when the analysis is complete. When CheMin is not receiving sample material, its inlet is protected by a cover. A mesh screen will make sure no large grains that somehow passed through the pre-screening process enter the instrument. Those grains will not pass through the screen and remain there for the remainder of the mission. Grains between 1mm and 150µm will pass into the upper reservoir portion and stay there until the cell is inverted. Then they are dumped into the sump. 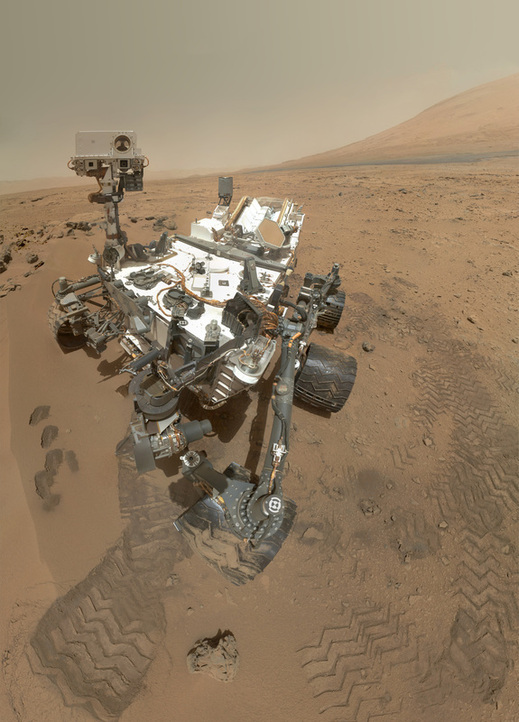 During the instrument’s operational lifetime of approximately one Mars Year, CheMin will analyze samples with no more than 5% internal contamination between different samples. Contamination originates from material that has remained in the funnel from previous sample processing and is delivered along with subsequent samples. Material portions remain in the sample cells after the dump is performed. Sample cells will be re-used at least 2 or 3 times to accommodate the 74 targeted analyses that are planned for the mission. Cells are emptied by inverting and vibrating the cells over a sump inside the instrument. Contamination may be reduced by sample dilution. To remove funnel contamination, aliquots of samples could be dumped into the funnel and be delivered directly to the sump via a shunt in the wheel without entering a sample cell. A full analysis of a sample will be called a major frame. Minor Frames are individual 600 × 582 pixel CCD images of 5-30 seconds exposure time. About 30 minutes – 60 to 360 frames are merged into a minor frame. 20 of those are used to produce a major frame. Obtaining a major frame that consists of numerous minor frames may require several nights for certain samples. Once the frame is complete, the data is stored and made available for downlink. Once the data downlink is complete, the analyzed material is emptied from the cell which is ready for re-use after completing the analysis process. Re-analysis capabilities are not given because there is no storage space for processed samples. 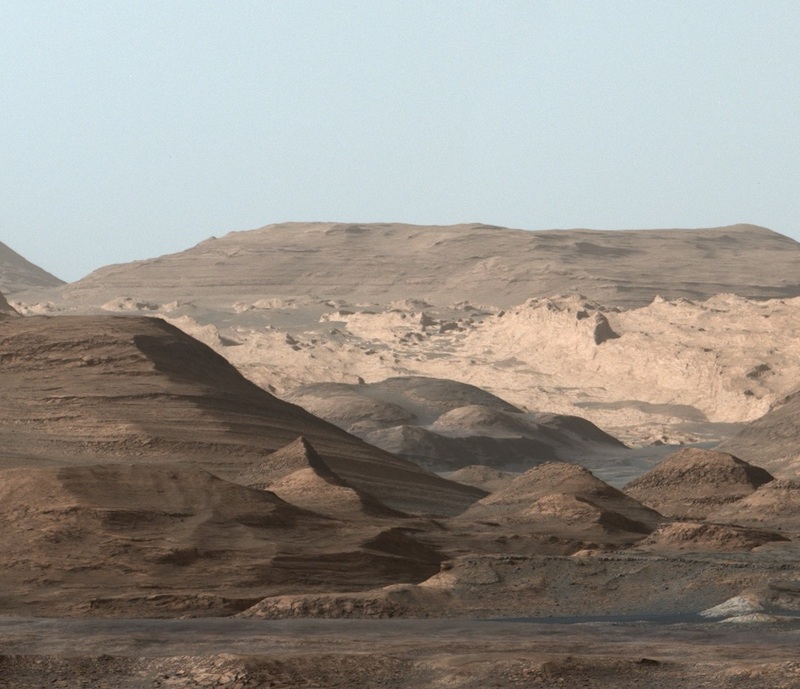 CCD Cooling is a constraint so that CheMin Operations will only be possible during Martian Night.